The new and breathtaking Columban Martyrs Memorial Garden on the grounds of St. Columbans in Bellevue, Neb., memorializes the legacy of 24 Columban missionaries who gave their lives out of fidelity for the Gospel in various countries of the world. They believed in something more than self and gave their lives in the same fashion. The Garden, which honors their scrifice, is a special place of reflection. The design of the garden speaks to the fullness of resurrection and life everlasting. It also signifies the unity that you have shared with us in our common missionary calling throughout the years. On May 26, 2016, the Garden was formally dedicated in an afternoon ceremony featuring Mass by the Most Reverend George J. Lucas, archbishop of Omaha, Neb. The homily was given by Columban Fr. Timothy Mulroy, U.S. regional director. You can read Fr. Mulroy’s moving homily below. We joyfully offer you the opportunity to be a part of the Columban Martyrs Memorial Garden by honoring a loved one with the engraving of a paving brick. For a gift of $150, you can honor or memorialize someone and by doing so, become a part of this beautiful garden that honors so much about our faith and calling. To place an order for your engraved brick, please contact St. Columbans at 402-291-1920 or fill out an online order form. 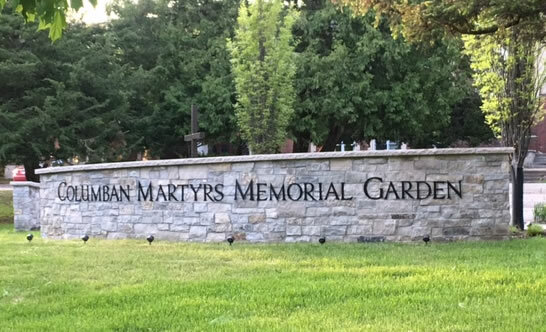 For more information about the Columban Martyrs Memorial Garden or to learn more about the Columban Martyrs who gave so selflessly, please contact the U.S. headquarters at 402-291-1920 or mission@columban.org. We are forever grateful for the part that you play in our shared missionary journey and we gratefully remember you in our masses and prayers.